In these days of escalating oil prices, itâ€™s becoming extremely difficult for a common citizen to pay off monthly electricity bills. The bills keep soaring day by day and there seems to be no respite in foreseeable future. These bills can be reduced by resorting to other methods of generating electricity, solar being one of them. This article dwells on the discussion regarding production of electricity through solar means and discusses a cost-effective strategy to achieve this end. The use of solar energy for the generation of electricity is not something new. Most of the countries are doing it successfully for decades and their population benefiting through the use of this free resource. But, to most of the people, it may still look like a mystery. These days, this energy is being utilized to light our homes, run fans, provide power to our fridges and microwave ovens, assist in warming our homes and swimming pools, provide power to our gardens and street lights, run our TVs and computers, and extract water from the sub-soil for irrigation purposes. A practical example of the use of solar energy could be seen in some villages of Pakistan where each house has been provided with a solar panel thatâ€™s sufficient to run an electric fan and two energy saving bulbs. Prior to this arrangement, the whole village used to be plunged in pitch dark during night. One such example is the village with the name of Narian Khorian, some 50 kilometers away from Islamabad, where 100 solar panels have been installed by a local firm, free of cost, to promote the use of solar energy among the masses. Through these panels, the residents of 100 households are enjoying light and fan facilities. Had these panels not been installed, the people living in this area wouldnâ€™t have even dreamt of getting this facility for decades as the provision of electricity from the national grid was a far cry due to the difficult terrain and high expenses involved. A layman would normally be interested in knowing as to how electricity could be produced using energy from the sun. Simply put, it can be said that the basic item required to generate this electricity is a solar cell, approximately 2 inches x 1/2 inch in dimension. These cells may be available in other dimensions as well. Some 80 to 100 or even more such cells are pasted on a tampered glass sheet whose dimensions are generally 1.5 feet x 4 feet. The glass sheet with cells pasted on it and inter-connected, is called a solar panel. The light from the sun is used to generate electricity through these cells. It may be clarified that itâ€™s the sunâ€™s light and not its heat that produces electricity. The solar cells are called photovoltaics (PV); the word Photo meaning light and voltaics electricity. The life of a solar panel is approximately 20 to 25 years! To give you an example of the use of solar energy, you must have noticed solar panels installed on poles along with the telephone booths on your left hand side while commuting on the Motorway. Each of these telephones is being powered by this panel. A battery is installed beneath each solar panel to store energy for keeping the telephone in operation during night when thereâ€™s no sun light. Itâ€™s a stand-alone system, entirely powered by solar energy. During emergency, the commuters make use of these telephones and call for help. To give you another example, if you happen to drive from Rawalpindi (Faizabad) towards Murree on the newly constructed Murree Road, you would see on your right hand side blinking red hazard lights installed at the top of each WAPDA pole. Each of these lights is being powered by a stand-alone solar system i.e. a solar panel and a battery. Just imagine, how much expensive and full of hassle it would have been if solar panels werenâ€™t used for this purpose and these lights were provided normal electric connections! In the photo above, solar panels are visible towards left. 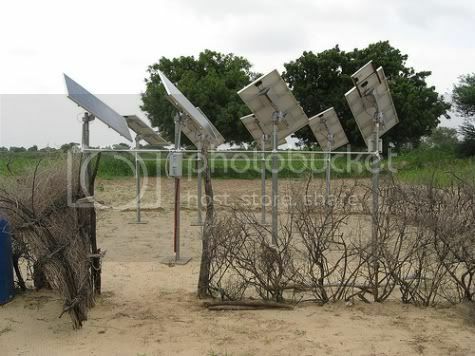 These Solar panels are being used for providing electricity to extract water and drip irrigation system. 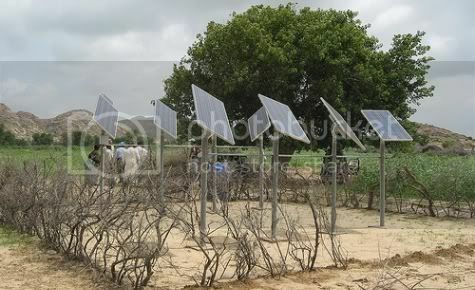 Solar panels are provided by Thardeep Rural Development Programme (TRDP) where as Micro Drip has provided the drip irrigation in a Nagarparkar, Sindh village called Wandhan jo Wandio. The region of Nevarra, Spain, is generating 70 per cent of its electricity through solar and wind energy. And, mind you, this region doesnâ€™t have any coal, gas or oil of its own. Itâ€™s really a classic example of making the best use of renewable energy in any country of the world! But, the question that automatically crops up oneâ€™s mind is: â€œIf it can be done in Spain, why canâ€™t it be done in our country?â€ The answer is a big â€œYesâ€. I will substantiate my statement by presenting you a strategy which, if followed, could be instrumental in generating this electricity in the most cost-effective manner. The cost of the solar systems can be brought down if we go for the manufacture of solar panels in country. Solar panels basically utilize solar cells in their manufacture. . In one panel, approximately, 80 or more solar cells are used, depending upon the power required and the electric gadgets you want to run utilizing these panels. Each solar cell costs approximately Rs. 1000 if imported from abroad. These cells would be required in millions or may be in billions if requirement of the whole country is to be met. We cannot import such a huge quantity of solar cells from other countries due to financial constraints. So, naturally, there would be no other option but to resort to manufacturing these cells in our own country. Once it has been decided in principle to manufacture solar cells in Pakistan, then we would look for three basic requirements i.e. raw material, trained manpower and necessary infrastructure. The basic raw material (quartz) is available in abundance in the northern areas of our country. But, this raw material is useless for us as far as its purification and development to a stage where this raw material could be converted into solar cells is concerned. This equipment will have to be imported; but it would be a one-time investment. One would be surprised to know that this raw material is being utilized by the local population of Northern areas for raising the walls of their houses in place of bricks as the poor simpletons donâ€™t know its value. Some of them take it for marble as well! The other raw material required to manufacture solar cells is silica (sand) whichâ€™s in inexhaustible quantity in River Sindh as water these days is otherwise in less quantity in our rivers. At least we should make use of silica in the manufacture of solar cells. So, to venture into manufacturing of solar panels, both the raw materials are available. The other requirement is that of manpower. I have no qualms in making a statement here that we have the finest and the most hard-working, skilled manpower available in country. From my personal experience, I could say with conviction that the retired personnel of the defence services who have been working on electronics and telecommunication equipment during their service careers would be the best choice for deployment on the manufacture of solar panels and cells. These people are highly skilled and disciplined and get retired at an early age. Shaheen Foundation, Islamabad maintains an up-to-date computerized record of such personnel who are just a telephone call away. The expertise of such workers is not less than any worker deployed in the western countries for such jobs. The only difference is that a European worker of such calibre gets US $ 45 per hour whereas a Pakistani worker, if he is paid $5 per hour (or even less) in his own country would be the happiest man around. While starting manufacturing of solar cells, it would be advisable if we do it in collaboration with a world-renowned company as India has done. It had a joint venture for the manufacture of wind turbines with a company that has 26000 wind turbines to its credit! This company has a name in wind industry and its wind turbines are being used the world over! This way, we would lay our hands on the best and the latest technology in the field of solar energy and our manpower would also be trained through short orientation courses as they already possess sound knowledge and strong technical base. By adopting this strategy, the cost of the solar cells is bound to reduce drastically with the result that these â€œprohibitively costlyâ€ solar panels would come within the reach of every citizen and the day wouldnâ€™t be far when weâ€™d see these panels mounted on each and every roof in each city of the country including the rural areas. The energy crisis would thus be a history for our citizens. Presently, thereâ€™s one and the only one factory manufacturing solar panels in Pakistan whichâ€™s located at Hattar Industrial Area near Taxila, 1-1/2 hours drive from Islamabad. But, due to various compulsions, itâ€™s importing these costly cells from abroad at an exorbitant price. In a solar system, apart from solar panels (which include solar cells), tampered glass sheets, batteries and inverters (to convert DC electricity into AC) are also used. We have innumerable factories producing good batteries in our country; so thereâ€™s no problem in their manufacture! Rather, we can go for maintenance-free batteries! Just augmentation of the manufacturing facilities of the existing factories is required. Regarding tampered glass, we have many glass manufacturing factories in Pakistan. In this case as well, weâ€™ll have to augment their existing facilities to produce tampered glass of required specifications. Again, I may mention here that itâ€™s a tampered glass sheet on which solar cells are pasted; this glass sheet with solar cells pasted on it is called a solar panel. Tampered glass is after all glass and nothing else. Required machinery could be imported and installed in our existing glass manufacturing factories. Thereâ€™s no need to set up separate, dedicated factories for each item. Letâ€™s make best use of our existing facilities with a bit of augmentation. This approach would be highly cost-effective! As far as converter is concerned, weâ€™re already manufacturing thousands of them for our UPSâ€™s which are installed in each and every house now, thanks to load shedding! Itâ€™s generally perceived and is true also that the cost of using solar energy is prohibitively high. But then somebody should answer my question too: If the cost is really that high, then how Nevarra is coping up with this high cost? The authorities in Nevarra must have taken some tangible measures to bring the cost down, out of which, one could be the manufacture of solar panels including solar cells indigenously. If the use of solar energy was that costly, then Nevarra would have abandoned this initiative long ago. I would also like to ask such people: If the cost is that high then why the entire Europe is still making use of this form of energy while the sunshine is very scarce in the European countries. We have to adopt measures to bring this cost down so that an ordinary Pakistani could purchase this system. And to do that, all the points are in our favour. Investing in a solar electric system has many benefits. It allows you to produce your own electricity with no noise, no air pollution, and no moving parts. Moreover, this system would never run out of fuel (sun light), and it will help reduce the amount of greenhouse gasses emitted by coal and natural gas-fired power plants. Due to these unique characteristics, solar electric technology has been called â€œthe ultimate energy source for the 21st centuryâ€. There are countries where people using solar energy have covered the entire roof tops of their houses with solar panels. Theyâ€™re generating electricity which is meeting, if not full, at least a part of their electricity requirements. As the cost of electricity provided by utility companies rises, they would be compelled to resort to solar energy in a big way. In some countries, solar systems have become so popular that senior citizens are investing their pension money in solar parks. The solar panels in these parks are connected to tracking devices that generate up to 40% more energy than fixed systems. One solar park is owned by as many as 700 to 800 individual investors, each of whom owns one or two large solar panels in that park. The income received from these panels adds to their pension amount and is guaranteed to be paid by the utility companies for 25 years. The cost of such panels is substantially reduced with a tax concession from the government. As the annual income is guaranteed, there is a long waiting list of willing investors. Another use of solar energy could be in the form of solar cookers. A solar cooker is nothing but a concave mirror fixed on a metallic stand. The mirror converges sunâ€™s rays at a focal point through reflection where a utensil is placed that gets heated. I have myself taken tea prepared on a solar cooker! Just imagine! Six thousand refugee families in Sudan are making use of these cookers successfully. Earlier, the women folk used to go out and bring thorny bushes as fuel for cooking purposes. With the arrival of the solar cookers, this practice has ceased and the forests are also saved. The people living in our hilly areas can emulate their example and use these cookers which might not be costing more than Rs. 1000 each! I may mention here that a solar cooker doesnâ€™t utilize solar cells. It utilizes just the reflection of sunâ€™s rays, and the sunâ€™s rays are free! To conclude, it can be said that solar energy is one of the most viable options for Pakistan. Even countries with less sun light are making the best use of this free resource (sun light). We, in Pakistan, arenâ€™t short of sun light as sun shines on the entire length and breadth of the country throughout the year. We can make use of this inexhaustible resource and contribute towards meeting the shortfall of electricity. If we donâ€™t do it now, then it would be just a matter of time when oil would be touching $ 200 a barrel and the World Bank would be pressing us hard to increase the electricity price by 100 %. Then, we would be left with no option but to grab every opportunity to generate electricity from any available source, what-so-ever! We should opt for the manufacture of solar panels including solar cells in-country. For this purpose, we should establish not one but several factories for the manufacture of solar panels and cells in Pakistan. We have unimaginable quantities of raw material at our disposal and our manpower is second to none. With the availability of abundant raw material at throw-away price and the cheapest yet highly skilled technical manpower, the profits that would be accrued is mind boggling!, Itâ€™s said that if enough solar panels using indigenous solar cell are installed and energy efficiencies are ensured, the home owners can receive a zero power bill! 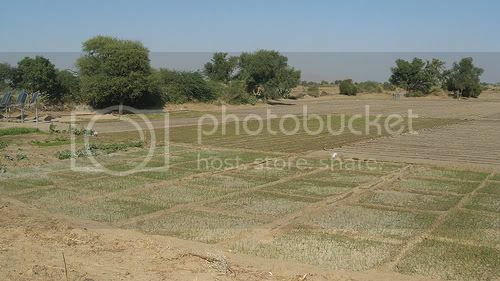 Photos for this post are courtesy of Saqib from his album Thar and Everywhere. Manufacture solar cells from raw material . This would involve work and money,knowledge and research. 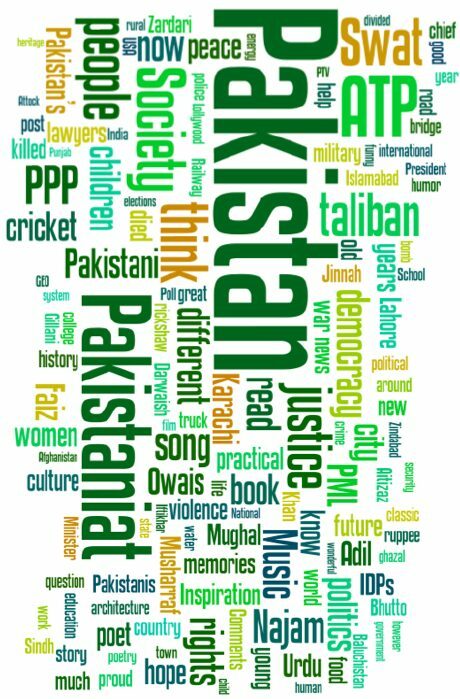 Pakistanis don’t want to invest in either of the above 4 entities. Andhair Nagri: Are We Serious About Energy Conservation?